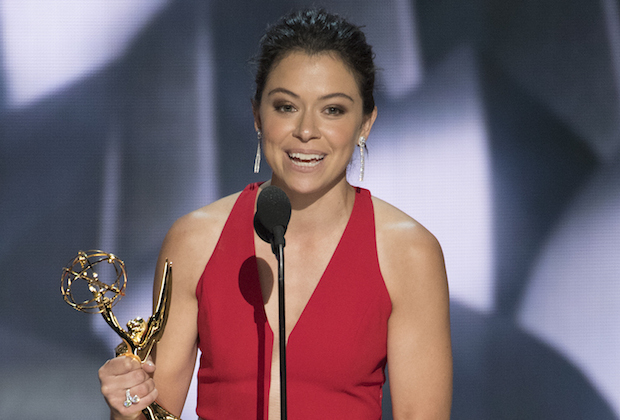 Something unbelievably relatable happened at this year’s Emmys. Like, SO. RELATABLE. Orphan Black’s Tatiana Maslany, who won for Outstanding Lead Actress in a Drama Series, didn’t think she’d actually win the category that boasted such nominees as Keri Russell, Robin Viola Davis, Wright, Claire Danes, and Taraji P. Henson. With no written speech available, Maslany took to her trusty phone (as most of us would do) in a totally boss move to thank people from a draft in her Notes app. However, it was at this exact time that a flood of congratulatory messages poured in from friends and family, dinging through the star’s speech at the absolute worst time. Ugh! We totally feel the overwhelm just thinking about it! These days, who doesn’t use their phone for stuff like this?! But of course, she handled it like the pro she is and we’re bowing down. Besides, all those interrupting dings were SO deserved! Way to go, Tatiana!